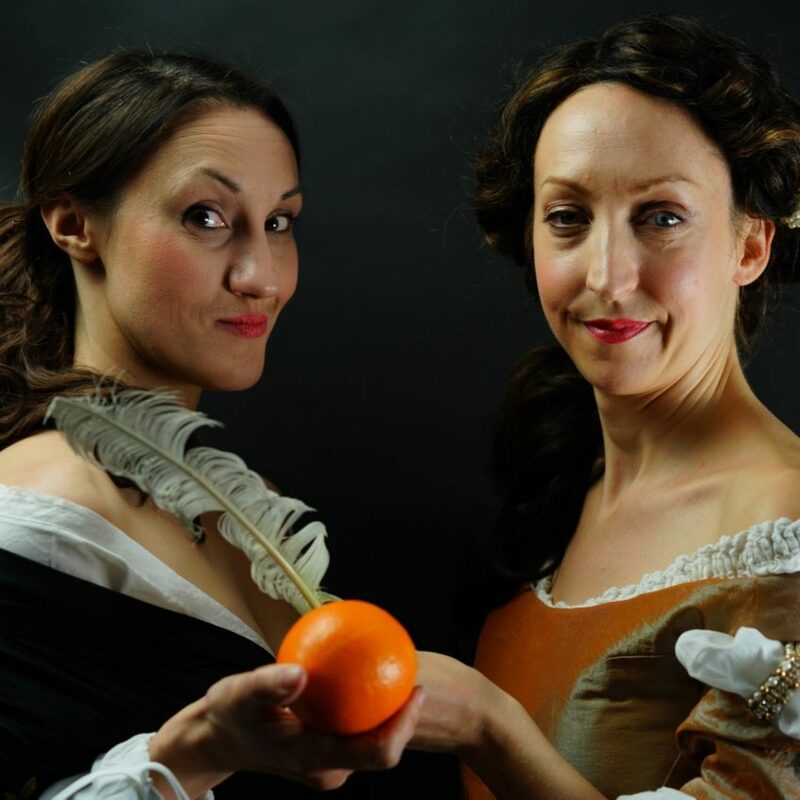 Last night I had the pleasure of attending the opening of Oranges & Ink, the latest play from writer, and actor; Claire Louise Amias, and sequel to her successful one woman play; The Masks of Aphra Behn. 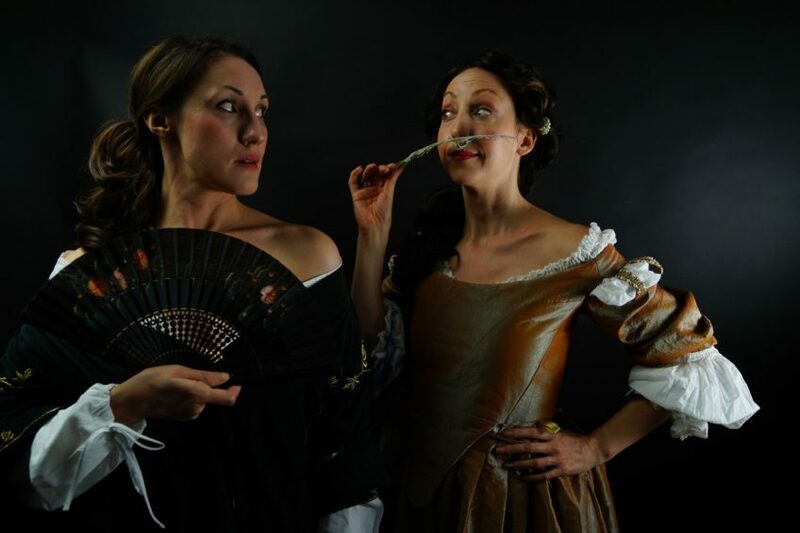 Amias plays Aphra Behn in Oranges & Ink alongside Sarah Lawrie as Nell Gwen and between them, Amias and Lawrie can boast an impressive list of stage appearances. Though being familiar with Amias’ work, meant I could be confident in the quality of her performance, I had never been to the Tristan Bates before, and was unsure what to expect. Quite unassuming on Tower Street in the heart of ‘Theatre Land’, I handed over my ticket and was (happily) led down to a cosy bar, where had I more time, you are invited to relax in an armchair and thumb through some of the many texts adorning the shelves. I had time enough though for a drink and to read up on the life and times of Aphra Behn, who I confess I was largely unfamiliar with. A bell was rung and the growing crowd was led back through reception and off into an intimate performance space, and no sooner had we taken our seats did the lights go out. I will say from the start that any 2 actors would have a difficult task in holding an audiences attention for an hour with limited props and staging on an uncommon historical subject. However, Amias and Lawrie did just that, and with ease. Over the course of the hour, somehow Amias has written us a play that showcases, the changing relationship between two friends and flowing themes of loss, identity and duty are presented through comedy, anger and anguish. A historical tale is given to us, that though unfamiliar as I was at the start, I feel I have a remarkable feel for now. An astonishing accomplishment for a 60 minute run time, and something many 2 hour Hollywood blockbusters could do with paying attention to! My only criticism at all, is that another 30 minutes would have been welcome, to explore more deeply some of themes that were presented. But I only want more, because I enjoyed it so much. Lawrie’s Nell Gwen, is extremely funny and a joy to watch as she plays the stage actor turned royal mistress, so eager to impress her old friend with the status she has been afforded. While Amias’ Aphra Behn gives us the sound of rebellion and reason that is so incompatible with Gwen’s conformity to the role she has been given. Both Lawrie and Amias give impassioned performances, which along with emotive sound design from The Lovekyn Consort, and some wonderfully subdued lighting under the direction of Alex Pearson, made me feel like I was in the 1600s watching a play written by Aphra Behn. So cleverly and subtly did Amias and Lawrie switch between a more natural stage presence, and ‘old time’ theatrics, that the effect enabled me to suspend my belief for the 60 minute performance and believe as much as any play can make me, that what I was being shown was real. Without giving anything away, special mention to Amias’ brief monologue near the end of the performance that shows just what a talented actor can do with our emotions. A very short run for this intimate and original performance, see it while you can. Funny, emotional and highly entertaining – and lets hope for a tour and part 3 in the Aphra Behn saga too.